You can post your questions about regular quick tournaments here. Please, don't forget to specify tournament number in case when you report the issue. Edited by Knopka_EU, 16 October 2018 - 11:46 AM. Matchmaking is based on number of tour which your team reached. For example, if you play in the 3rd tour, you will only play against teams which reached the 3rd tour too. Winter Malinovka map was changed to Vineyards map. Himmelsdorf map was changed to Port Bay map. Himmelsdorf map was changed to Canal map. Winter Malinovka map was changed to Port Bay map. Himmelsdorf map was changed to Yamato harbour map. Winter Malinovka map was changed to Desert Sands map. Himmelsdorf map was changed to Castilla map. Winter Malinovka map was changed to Canal map. Winter Malinovka map was changed to Oasis Palms map. Edited by TheEdwardo199, 24 February 2018 - 04:42 PM. УЖАСНО ЧТО ВЫ ЗАМЕНИЛИ ПРИВЫЧНЫЕ ТУРНИРЫ НА БЫСТРЫЕ БОИ.... ВСЕ УЖАСНО.... ВЫКИНУЛО С ИГРЫ... А СЕЙЧАС ПРИ ВХОДЕ В АККАУНТ ВЫДАЕТ ТО ОШИБКУ 102... , ТО ОШИБКУ 64...БОЛЬШОЙ ЖИРНЫЙ МИНУС ВАМ..ФУ! I know that we are not alone with this issue. But from the other hand other had opportunity to continue their fitght till end of tournament - our last opponent [-W1N-] continue fight till end even if they only won one battle with us (cheers W1N!). WG Team, please let us know what will be done with this issue. we already know about this issue. 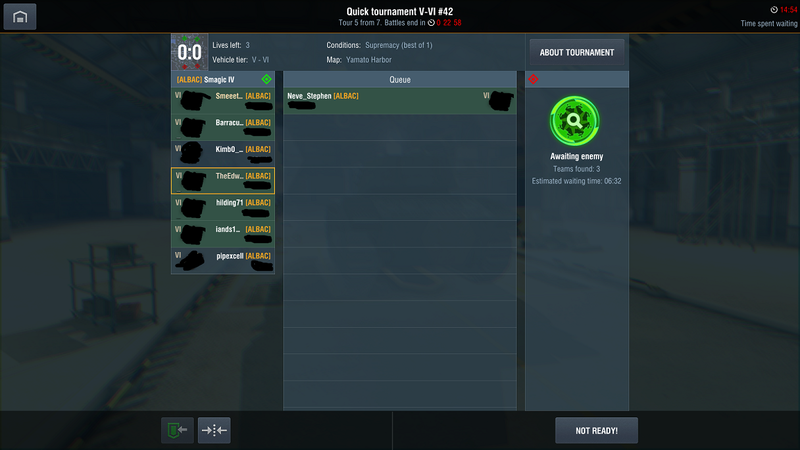 Players will receive reward for the round they reached at the moment of problem happened. We will still be behind with cups as we could not participate after that (second life in first approach and second approach). That’s unfair for those clans and from the other hand I know it is hard for you to determinate what to do next - cancel all turnament? Reset cups? I left you with decision but as a clan that had this problem we feel a little bit disappointed and deceived. Some compensation should be made. We published news in the game client about the compensation for all the players affected by this issue. Please check. I saw it. Just be clear - compensation is for all players. So clans that was not able to restart battles in next approach are still in disadvantage. Hello. We were playing the Spring Season tournament today, we are in the third round, we suddenly knocked out the game to the garage and nothing could be done about the tournaments, here is my question about the rewards, will there be any compensation for it? I would to clarify what's happening and why some technical problems come. Since the release of version 4.7. we faced with unexpectable technical issues on the server side. Our technical specialists working hard to fix them. We restarted a game server yesterday and released a server fix with it which should solve the issue. In the current time we also know that some of players haven't received their reward for quick tournaments according the round they reached. We need some time to calculate how many players faced with that problem and we will try to distribute treasures for them. About the leaderboard: all the player were affected by the issue. The gap now is not so great in the number of cups, each clan has a chance to catch up, taking part in the quick tournaments that take place every day. If we will decide to wipe the leaderboard - we will inform about this (but we try to avoid this). According questions about the compensation: yesterday the news about this was released. All players will receive 2 premium days. To get them you should play at least one battle from March 3 to March 5. With all due respect but from one hand you said all players were affected and from the other you still calculate how many clans faced problem. I think all clans should have fair start. From gamer perspective you are manilpulating who will earn cups. I thing with this kind of thinking is killing rivalry of all tournament. Would you still left current cups If such case would be valid for some top clan? Difference for top clans may be those 2 days od your server technical issues (cup for 4 tournaments). For non top clans those points in leaderboard define not only rank but as well prizes for end of tournament. It is a problem and you should be aware about it. sadly you didn't get me well (I'm sorry in advance for my non-perfect English and may be the problem in this). I mean now we are calculating how many clans did not received cups. For a some of them cups were already accrued (proof) and will be accrued for others. Yes, all players were affected by the problem, it means that the problem happened at the moment when all teams were reached the maximum round they can from the moment of tournament started. If team reached Round 3 - they will receive reward and cups for this round, if team reached just round 2 - they will receive reward for this. In this case all the teams are in the same conditions. At least there are a lot of tourneys ahead. Let's go further, every clan still has a chance to reach top-poisition in the leaderboard and not so much time passed since the season started. I would really want to have Saturday quick tournaments as well at 19:00 UTC because this is the only time when most of our clanmates are online, and a good timing for other people as well because this is usually the time when people are not in work, and do not have to sleep early for the next day. (We are glad to have Saturday 19:00 UTC slots in regular tournaments in the off season but would like to those as well in the spring season.) Besides, is it possible to have registration process some days before too? It seems we have to rely on Google Docs to see if our clanmates could join the tournament and sadly the response is not as active as an ingame registration. Thanks a lot! Edited by Wildoneshelper, 03 March 2018 - 07:12 PM. Don’t worry about english, I’m not that fluent as well . looking forward for your calculations. chci se vrátit do výcviku, jak to mám udělat? On weekends all regular tournaments will take place only at the daytime. It caused because of Qualifiers and Professionals tournaments which will take place on evening these days during the season. Some rewards for the tournaments from March 2 were accrued today (including cups). Could you please check it? If you would like to start a battle tutorial once again you need to create one more account. Because if you're already passed it you can't go through it twice.